Andrea has a rich marching career starting in 1987 with the Reading Buccaneers, 1988 and 1989 with the Garfield Cadets, 1990 thru 1994 returning to the Reading Buccaneers, 1995 with the Bushwackers, 2011 to 2019 once more with the Reading Buccaneers. 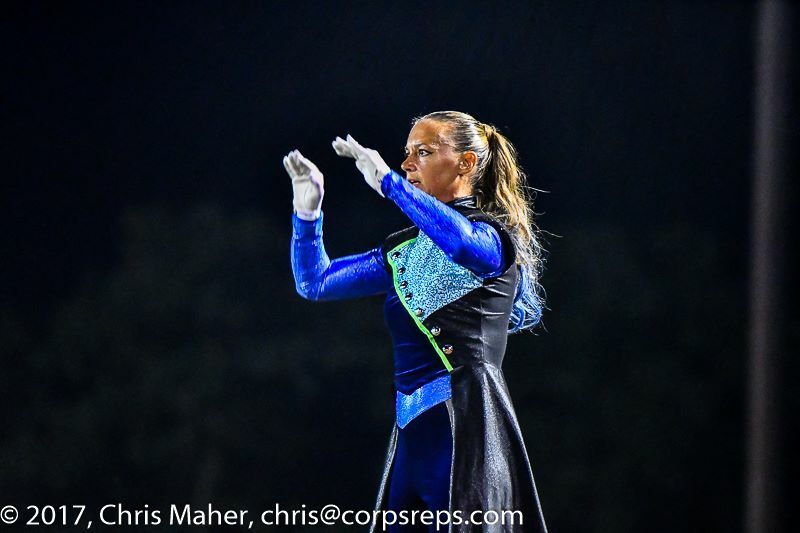 2019 marks her eighteenth year in drum corps and fifteenth as a Buccaneer, thirteen of which serving as their Drum Major. Andrea first started going to drum corps shows in 1983 and tried to figure out how she could march since she was a flute player. She taught herself how to play the mellophone and joined the Rosetto Chieftans in the beginning of 1987. There she met members who were marching in the Reading Buccaneers. They told her there was a soprano spot open, so she filled that spot in May and brought her little sister along to march in the rifle line. Andrea chose DCA, because as a self-taught mellophone player dreaming of marching in the Garfield Cadets, she used marching in DCA as a stepping stone to gain experience. Reading was the perfect place. After a year of marching in DCA, she auditioned for Garfield and made it. Andrea aged our in 1989 but wanted to give back what she ” took ” and returned to the Buccaneers. About this time her life and career started taking off. She has been able to remain with DCA for this long because it is a place where you can enjoy your passion on the weekends and still manage a life, career and family. Andrea did take a break from drum corps in 1995 to start that family, but she always dreamed of someday marching with her two children. Her dream came true, marching with both of them for two years in 2012 and 2013 and then with her daughter for another four years in 2014 to 2017 There were times where she just looked at them on the field from the podium and literally got goose bumps. To be able to share something they are all passionate about and spend a large amount of time together throughout both the winter and summer months was priceless. She was so proud watching them work really hard at something they loved. Having all of that time with them and watching them push themselves, making life-long friends, and being part of something much bigger than the three of them brought them really close together as a family. Andrea’s most memorable drum corps moment came in 2013 during and immediately after their DCA finals performance. She didn’t think she could feel more happy or more proud of what the 2013 Buccaneers accomplished during that finals run in 2013. Their journey together that summer was mostly very hard and yet incredibly rewarding. Andrea was grinning through their entire performance due to pride and enjoyment and by the time they ended she was in tears! As the corps was preparing for retreat, and before any scores or placements were announced, she turned and saw her two kids sobbing and hugging in love and happiness for the performance they just left on the field and for what they were a part of together. Her happiness and pride somehow doubled and to her that is what being in the Reading Buccaneers is all about. Andrea’s career as a regulatory affairs professional for a vaccine company, Sanofi Pasteur, keeps her pretty busy during the week. However, in her spare time she likes attending Penn State home games to watch McKenna (and Connor in the past) march in the Blue Band. She also enjoys knitting and crocheting and playing her bagpipes. (She used to march in a pipe band but due to drum corps conflicts she now just chases bears with them). She also enjoys gardening and doing Spartan Races with her boyfriend and fellow Buccaneer Greg Shelley. Her message to drum corps fans when they watch the Buccaneers perform this season: It will be similar to last year where they will explore new things. It promises some really challenging and fun music this year and hope that all fans will enjoy their show. Andrea Gwyn is a fierce competitor, a true leader, and a winner. She may well be one of the most underrated drum majors when all is said and done. She is not flashy in her conducting but all this lady does is win!